Faculty of Law, Centre of European Law and Politics, University of Bremen, Bremen, Germany. 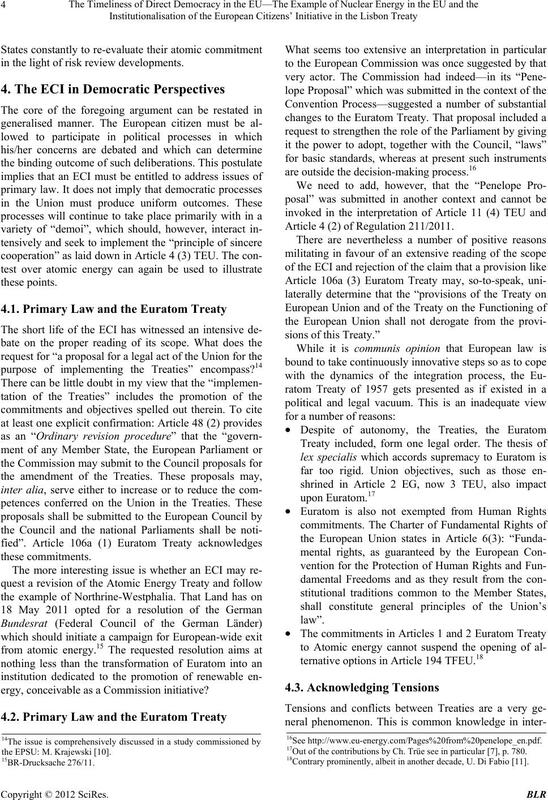 Received October 19th, 2011; revised November 13th, 2011; accepted January 9th, 2012.
indeed be used to instigate a European-wide debate which may even tually lead to pertinent changes in the Treaties. of atomic energy (Section 3). CRETARIAT. 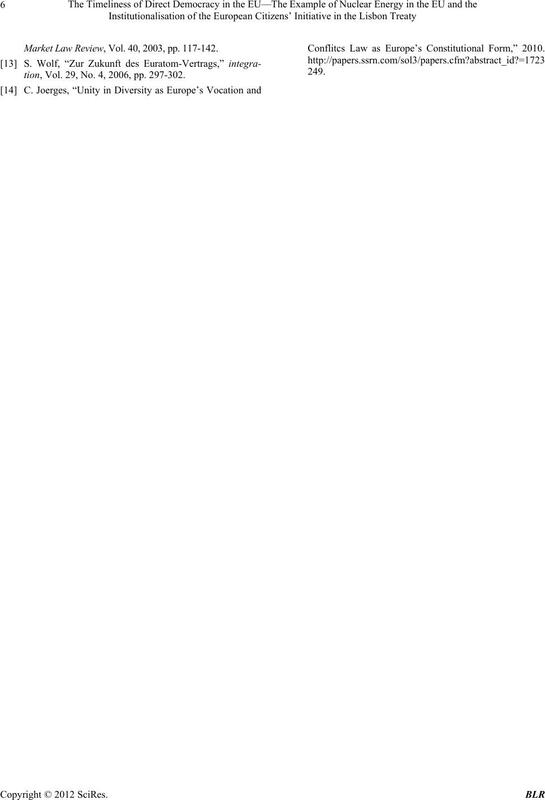 (CONV), 650/03 of 2 April 2003 (Presidency). policy issue is only conceivable at a transnational level. ground to and inspiration for European decision-making. formity rather “unity in diversity”. 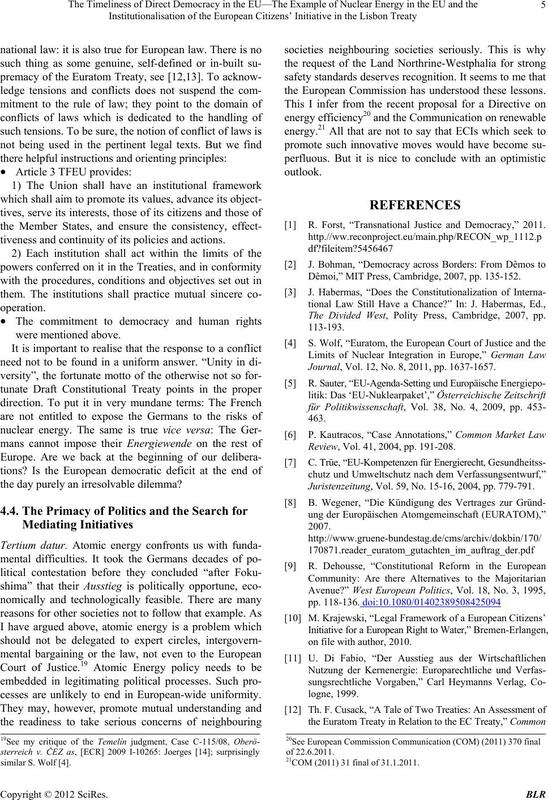 mocracy itself the subject of democratic deliberation of citizens “(p.
(Full Court), [2 00 2] European Cour t Reports (ECR) I-11221, para. 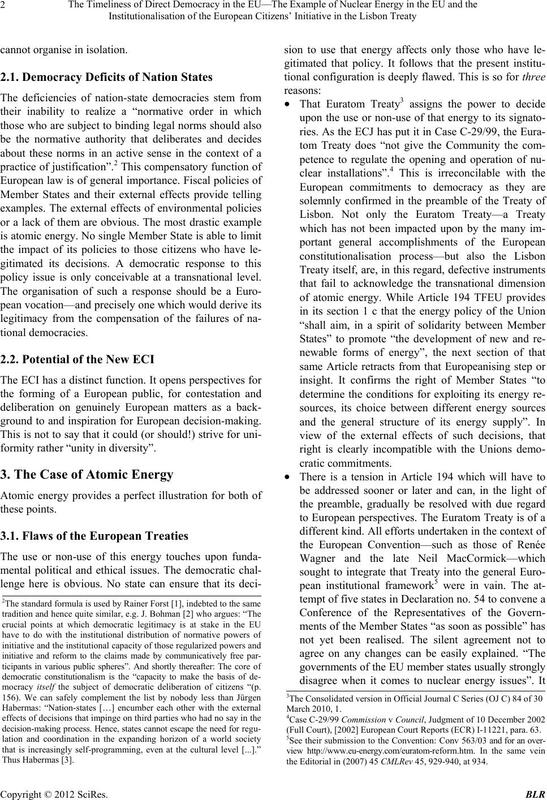 63.
cisely at this point the ECI opens up new perspectives. 7Opinion delivered on 13 D e c e mber 2001, para . 132.
accepted, see Article 50 TEU. communis opinio, read today more like a provocation. 12OJ C 306/199 of 17.12.2007. 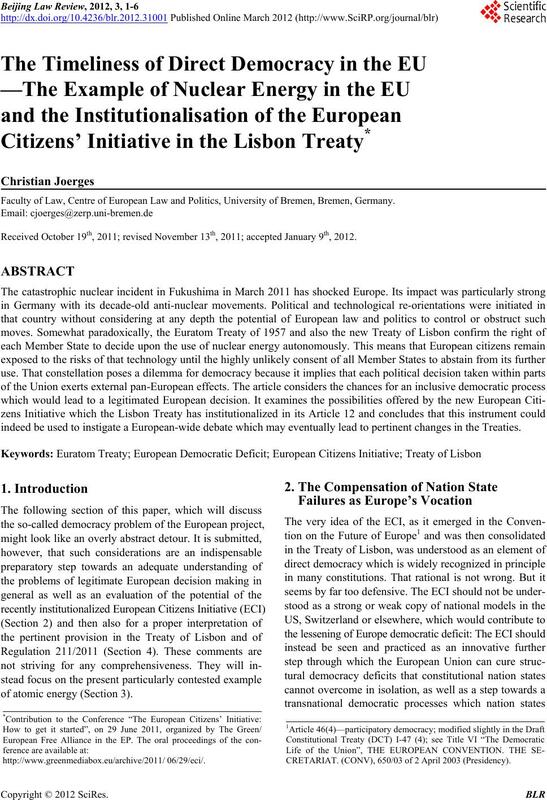 13See the citation from J. Bohman in note  supra. in the light of risk review developments. ergy, conceivable as a Commission initiative? Article 4 (2) of Regulation 211/2011. 17Out of the contributions by Ch. Trüe see in particular , p. 780. 18Contrary prominently, albeit in another decade, U. Di Fabio . the EPSU: M. Krajewski . tiveness and contin uity of its policies and actions. the day purely an irresolvab le dilemma? cesses are unlikely to end in European-wide uniformity. the European Commission has understood these lessons. R. Forst, “Transnational Justice and Democracy,” 2011. Dêmoi,” MIT Press, Cambridge, 2007, pp. 135-152. The Divided West, Polity Press, Cambridge, 2007, pp. Journal, Vol. 12, No. 8, 2011, pp. 1637-1657.
Review, Vol. 41, 2004, pp. 191-208. Juristenzeitung, Vol. 59, No. 15-16, 2004, pp. 779-791.
on file with author, 2010. 21COM (2011) 31 final of 31. 1.2011. Market Law Review, Vol . 40, 2 0 0 3 , pp. 117 - 142.
tion, Vol. 29, No. 4, 2006, pp. 297-302. 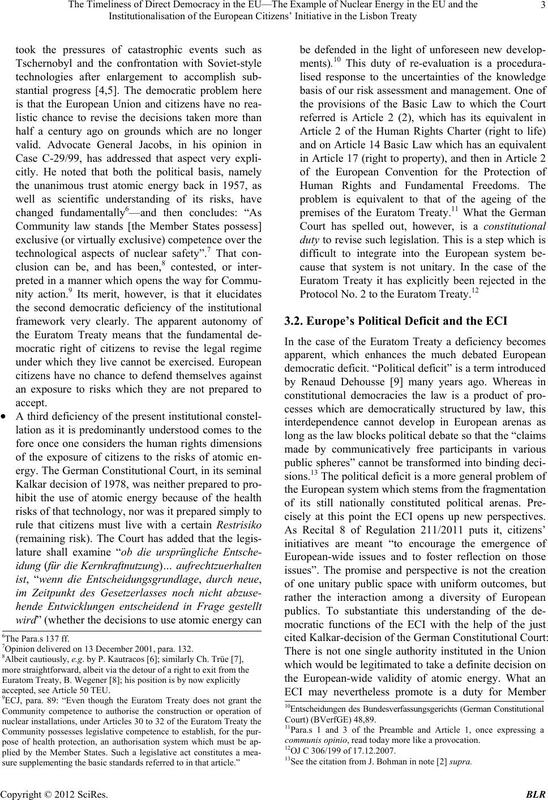 Conflitcs Law as Europe’s Constitutional Form,” 2010.